Task was removing slab-on-grade sidewalk adjacent to C-store with a backhoe. Locates had been completed and showed that the gas line was ~ 1.0 m away from sidewalk. 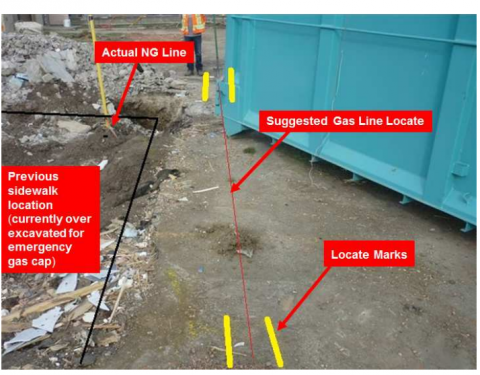 There had been confusion between NG utility company and their site services contractor (ATCO) to cut and cap main supply line to site. Initial visit shut off the supply from onsite meter only. Full site cut and cap needed to be rescheduled. Timing was another 20 days. IOL Contractor elected to remove the sidewalk, which did not involve excavation and was beyond limits of NG locates. 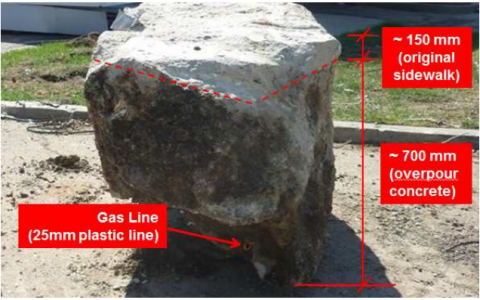 Work had been proceeding normally until removal of one of the sections resulted in a hissing sound, found to be a buried NG line encased near the bottom of a large subsurface concrete mass below and part of that section of sidewalk. Area was immediately evacuated and all equipment shut down. NG utility company emergency services arrived within 10 minutes. • Decision to proceed without full isolation was not considered a risk. Additional line locating efforts (e.g. hand digging, hydro-vac’ing) would have helped to avoid this incident. • Whenever there is a scope change, work needs to stop and risks need to be re-evaluated. Any changes need to be properly mitigated and documented on JSA and signed off by site superintendent. • Subsurface utility locates serve only as a guide, there is no substitute for hand digging or hydro-vac’ing to positively identify subsurface utility locations. • Last minute risk assessment, “what could go wrong” is an ongoing process that not only identifies and considers risks and hazards but properly mitigates those same risks and hazards to avoid injuries or damages. • This is an incident that resulted in no property or equipment damage and more importantly, Nobody Got Hurt. • The potential for serious injury or damage was significant. • Our safety tools are there for a reason, using them properly keeps us safe.